Construction projects becoming larger and more complex require new advanced machines. Fives supports equipment manufacturers in the development of new technologies. Construction vehicles have grown in size and with them the parts used in the manufacture of excavators, bulldozers and loaders. With machine tools that handle parts of virtually unlimited size and weight, Fives machine tools are designed to handle the demands of large part production. Large construction parts often have long cycle times and require heavy metal removal. Fives machine tools are renowned for their reliability, an attribute key to cutting parts with cycle times that last through multiple shifts. 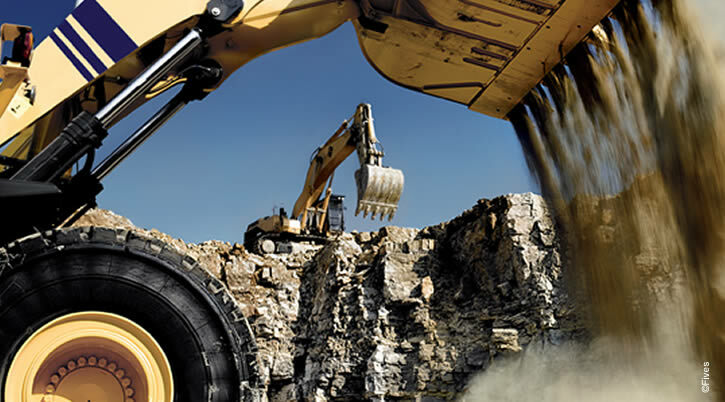 The powerful drives and rigid machining platforms take heavy cuts with ease. Moving large parts from machine to machine extends production times and can lead to accuracy errors. By offering attachments that add functionality, Giddings & Lewis boring mills allow construction equipment manufacturers to do more machining in one setup. Automation such as the pallet shuttle systems of Fives machining centers allow equipment producers to setup a new part while one is machining. The gains in productivity and parts quality can be substantial. Portal mills are well-suited for long parts, multiple part setups and five-sided machining often required by construction equipment manufacturers. With multiple heads and automatic head changing, production times on extremely large parts are further reduced. With swings from 1 to 9 meters, Giddings & Lewis vertical turning centers handle a wide range of parts from small planetaries to wheel hubs from the largest construction vehicles.